A QR (Quick Response) code is a matrix barcode readable by smart phones and barcode readers. The code consists of black modules arranged in a square pattern on a white background. 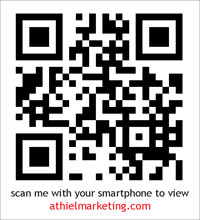 Act as a weblink – Clients scan the code and their phones will display your website or a specific page of your website. Great for anything you can print on ads, t-shirts, coffee cups, business cards and so much more. Generate a contact – With one scan all your contact information is saved to the contacts section of the phone. Great to put on business cards or have as a trade show display. Display images – Great for displaying e-coupons. Generate a contest entry – fun way to run a unique contest. The great part is that there is also an incredible back end to QR codes. Place the code in a print ad and we can tell you how many times the ad was scanned, where geographically they were located, and even details on the user. Imagine finally being able to track how many people are seeing your print campaign. Using the back end is fantastic when tracking mailouts – why were there so many more scans in Montreal and not many in Vancouver? Regardless of the size of the campaign or the nature of the business you can be sure that our specialists at A.Thiel Marketing will be able to handle any of your QR code needs.